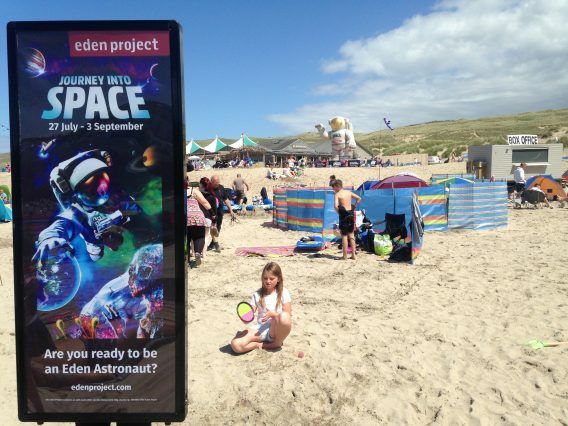 Eden Project approached eventeem to assist them in promoting their exciting Journey into Space Programme this summer. Aimed at young families, this event would show children what it’s like to be a real astronaut with the help of Tim Peake. Eden Project wanted to make local people aware that this event was taking place so wanted to target large events across Cornwall distributing badges for children. eventeem recruited local Brand Ambassadors to visit events in Cornwall armed with plenty of badges, MediaWalkers, branded uniform and even an inflatable astronaut! As the Space Programme coincided with the summer holidays there was no shortage of young families out and about so conversations and engagements were plentiful. Our illuminated MediaWalkers really stood out from the crowd and definitely created a buzz around the event.